The HP Indigo 6900 Digital Press Arrives in Label Tech . Changes in consumer behaviour and market trends are prompting brands to adapt and evolve, constantly looking for ways to SAVE money, SPEED time to market and ENGAGE better with consumers. For Label Tech, this translates into a dramatic shift from traditional long runs to short runs and “new” long runs, consisting of multiple SKUs, brand protection features and variable data characteristics. The new HP Indigo 6900 allows us to seize this amazing opportunity to add value to our loyal customers by enabling them to print anything, in the most productive manner, and at the highest quality. The HP Indigo 6900 Digital Press is manufactured carbon neutral and with greatly reduced production waste, it is an energy efficient machine. - High-value colours. Add value to any application with our extended colour ranges, including ElectroInk Silver, Fluorescent Pink, and invisible inks. - Widest white portfolio - choose from a wide range of opacities, including the ElectroInk Premium White, a versatile, opaque white. - Enhanced resistance. Address high-performance applications with Pack Ready for Labels, designed to improve the labels’ resistance against water, chemical and mechanical exposure. - Save time and money on highly decorated label jobs, by allowing the addition of variable digital foil, tactile, varnish and special effects in a single pass. - Unlimited designs. HP SmartStream Mosaic variable design technology enables a one-of-a-kind, memorable customer experience and adds value to products. It automatically generates millions of unique designs from a fixed number of seed patterns and colour shuffling capabilities. 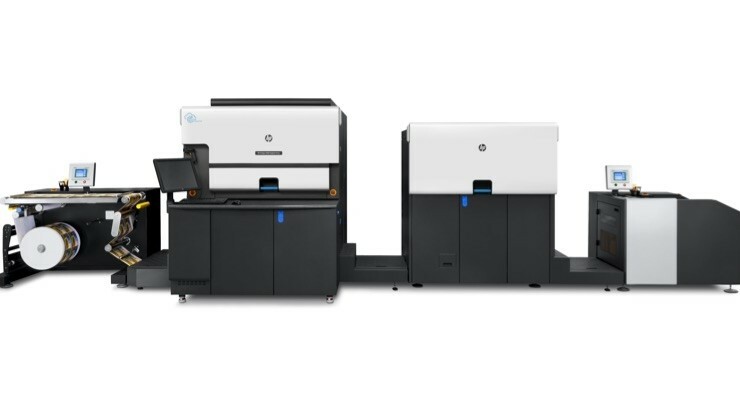 Call us today on 01-8421700 to see what the new HP Indigo 6900 can do for you! Label Tech is an award winning independent company that has been producing labels in Ireland since 1992. Many of our customers have been with us since day one. Like them, we value loyalty & are always ready to go above and beyond to deliver a premium product. Our helpful and professional team is always happy to hear from you. If you have any questions or would like to hear more, please be sure to contact us. Label Tech Ltd, Unit A2-A3, IDA Industrial Estate, Santry Avenue, Dublin 9, Ireland, D09 XE43. © Copyright Label Tech Ltd. All rights reserved. | Registered in Ireland No 191824.